(We don’t know anything about Dark Matter). We don’t know, for example, if Dark Matter is matter at all. We assume it is only because “it” has gravity–but we don’t really know what gravity is either. There are four forces that make our reality happen, and science understands three of them really well. All the “forces” in nature are caused by tiny particles of one type swapping particles of another type. There’s the electromagnetic force, which is carried by photons. Light, magnets, and electricity are all manifestations of this one. There’s the strong nuclear force, which is carried by gluons. Protons and Neutrons are made of quarks, and the strong force holds them together, both the quarks to make a proton, and the protons to make a nucleus. There’s the weak nuclear force, which is carried by W and Z bosons. The weak force creates radioactive decay and nuclear fusion. Then there’s gravity. We don’t know what particle carries gravity, and none of our particle accelerators have been kind to the theories that make a proposition. Everything we find in our experiments validates the Standard Model, which works by pretending gravity does not exist. Even though Einstein did a great job showing us how gravity works at a cosmological scale, we still have no idea how gravity actually happens. It’s a mystery. 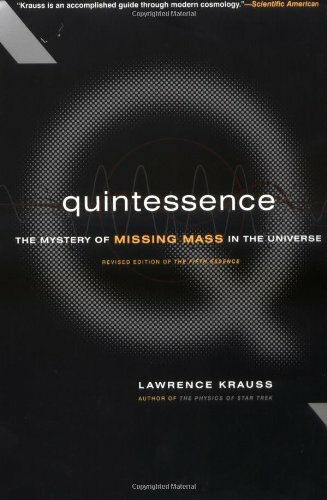 What we know is that some particles have mass (from something called the Higgs field), and that anything with mass attracts other particles–even massless particles like photons. When we count all the matter in a galaxy, all the stars, planets, comets, black holes, etc., there is not enough gravity to hold them together. The stars are all moving fast enough that galaxies should fly apart, but they don’t. We first noticed this in the 1930s, and we still don’t know why. We just call it Dark Matter. Probably the most popular hypothesis among scientists is that Dark Matter is made of WIMPs (Weakly Interacting Massive Particles). Since Dark Matter is like 85% of all matter, we’re probably swimming in the stuff right now. But, we can’t tell—the only force we have that interacts with WIMPs is gravity, which is rather inconveniently the only force we don’t understand. One hypothesis that makes a lot of sense to me is that WIMPS came from ancient black holes that have evaporated via Hawking Radiation. Shortest answer: Dark Matter is some unknown force that holds galaxies together when they should be flying apart. Lawrence Krauss has a book meant for “popular audiences,” but it’s still a challenging read. Good for those who really want to go dancing in the dark. It's not enough to ask, "Is God real?" First, you have to ask, "Which God?" There are diverse and conflicting definitions for God in our world. What do we know about God scientifically? In the video below, Astrophysicist Dr. Neil DeGrasse Tyson answers the question, "What is the most astounding fact you can share with us about the Universe?" His answer explains why I love astronomy so much. "Let there be light" takes on a more profound meaning. 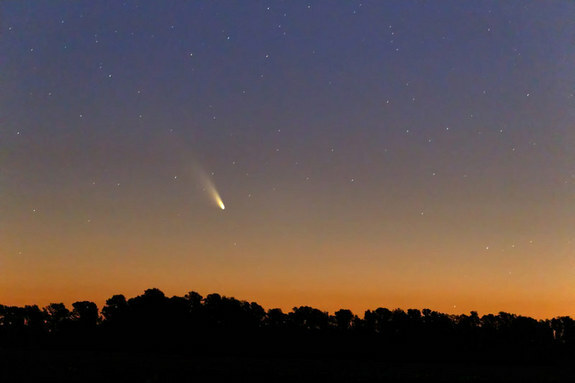 Comet Pan-STARRS will make it's North Hemisphere debut tonight. Space.com has an excellent article on how to spot the comet. If you're in Tallahassee, I'll be at the JR Alford Greenway tonight with my telescope. You are invited to join me. After everyone has seen the comet, we should also have good views of Jupiter and the Orion Nebula–both are beautiful sights in a telescope. We'll start looking right at sunset. What: Comet Pan-STARRS viewing, with Jupiter and Orion as well. When: March 7, 2013 starting at 6 PM Eastern. This image was taken in a desert. In the sky you see three points of light. Those lights are Earth, Venus and jupiter. Earth? Of course. This picture was taken on Mars. How does that image make you feel? Proud? It is remarkable that we have the ability to send out machines to other worlds, and in doing so expand our view so far. Does it make you appreciate how wonderful our planet is? We discover new planets around other stars all the time now. Planets appear to be very common. There are likely hundreds of millions or more in our galaxy alone. So far, we only know of one like Earth–only one planet so blue, so perfectly temperate. We live on the only rock floating in space positively covered in water and thriving with life and biological diversity. It makes our politics seem silly, doesn't it? We posture over the best ideology to operate tiny land masses that are completely invisible from even the planets closest to us. We have fierce and fiery arguments over how much government intervention is the right amount. We even fight wars over who has the right to land or resources. There are countless objects in our own solar system large enough to smite us which drift around on aimless orbits. These objects have hit our little home before, and they will do so again. Perhaps not for millions of years, if we are fortunate. I study astronomy. I share it with you. I do that because I believe deeply it is time to begin to elevate our discussion as a species. When you view the Earth from other worlds you become aware of just what a treasure, and indeed what a gift we have been given. We must cherish it, as it is the only such gift we have. I am a Christian, but I am also an avid scientist. My prayer is that the every expanding knowledge of how our Universe was made would elevate us, the Believers and those who do not, to understand just how much we share, and how much our cooperation is needed. Do you believe (as I do) God created our world and suspended it in space? Do you believe a perfect cradle was made for us? Then I ask you to look at our other planetary neighbors and understand just how fragile our cradle is. Venus and Mars have much to tell us about what happens to planets with too few plants or the wrong balance of heating gases. Do you believe that the universe was created by completely natural phenomenon? If so, you likely already understand the precious rarity of life. You also contemplate morality as something that emerged in social species as a way to ensure higher survival rates for members of the group. Would you consider that such a neurological drive for morality may also exist for belief? And that it has healthy and unhealthy expressions in society? I want you to know that there is an awakening in the world of faith where science is accepted, and many more people of faith every day want to partner with you. Astronomy should tell us all the absolute necessity of transcending our differences and working together. I hope we are ready for that lesson.